That Andy. Due to leave the GPO within the month and already cannae get out of bed, or so he said. Plan was for a rare cycle to cafe outing on another solar-powered day. Then things changed, as they're wont to do, and two wheels became four. I'm in a car. I can't carp. Through the mean Martlesham backroads, down and up the Brightwell dip and lo, it's Westwood Ho! 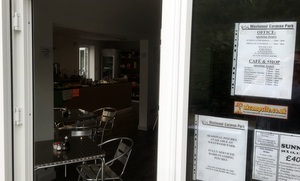 Pleasing roadside signage proclaims a fulsome twelve hour opening period for the Westwood Caravan Cafe. No immediate response at the barrier but we're given the nod to park in the gravelled area. Memories of the nearly non-existent savoury options at a previous campsite trip (the infamous Moon & Sixpence) fade away on seeing the menu inside. Bacon sandwich, sausage sandwich, all day breakfast, etc. Egg and beans on toast for me, ta very much, plus a bacon sarnie for the chauffeur. Seated outside (too nice to sit in there) on the decking with a captivating view of a cavalcade of caravans, it's not long before two bits of granary toast are presented with proper HP. More than satisfactory sandwich for Andy, like his Nan used to make with lashings of butter. Thumbs up for cans of new-to-us St Helier citrus drinks, one in the eye for San Pellegrino. Andy's back inside to assess the many products on sale in the campshop from pegs to soup to shaving gel but thankfully emerges with prepacked goodies, a hunk of Belgian choc loaf cake (from Lichfields) and a wodge of lemon tart (from Margaret's Country Kitchen). We need those calories after our long drive, not. Perfectly OK pushbutton lattes add a shot of caffeine to our imminent sugar rush. Really could have done with putting the pedal to the tarmac on our return journey. If it was a car -- Westfield Megabusa. If they were passing by -- Barry Newman.